Minnesota is living under a $27 billion mountain of student loan debt.1 A student graduating in Minnesota today has an average of $31,000 in debt.2 Whether we realize it or not, it is affecting both individuals and the broader community. 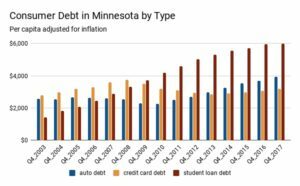 The challenge of student loan debt in Minnesota is explored in a new North Star report entitled The Debt Dilemma: Student Loan Debt and the Minnesota Economy. 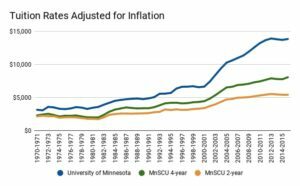 Higher education in Minnesota developed under a set of ideals about shared benefits and shared responsibilities. Minnesota State and the University of Minnesota were developed to ensure that Minnesotans across a broad range of geographies and backgrounds had access to professional, vocational, and liberal arts education.3 The state benefited by having one of the most qualified, most educated workforces in the nation. Like the mortgage crisis that sparked the great recession, it is easy to think about student debt as something that rises from individual bad choices. Digging deeper, hower, a series of decisions by both the private and public sector stacked the deck against students who want to pursue higher education. Jobs that once required only a high school diploma now require credentials from a higher education institution and investment in higher education has failed to keep pace with inflation.4 The economics of higher education has changed so much that the experience of student debt is completely unrecognizable from thirty years ago when a summer job and work-study was enough to keep debt levels at manageable levels. While in our current economy student debt is a challenge that is holding people back, experts are pointing to a looming student debt crisis in the event of a recession.10 Student loan debt cannot be discharged in bankruptcy and people cannot walk away from it or sell it. The burden of student debt will weigh particularly heavily on students who did not complete higher education but still accrued debt. This is not an unsolvable problem, but there is a cost. Student loan debt forgiveness, decreasing the cost of higher education, creating more support returning students who want to complete their degrees, and robust monitoring of for-profit higher education institutions can all help address parts of the student loan debt challenge. 3Oliver C. Carmichael, The Roots of Higher Education in Minnesota, Minnesota History, Autumn, 1954, http://collections.mnhs.org/MNHistoryMagazine/articles/34/v34i03p090-095.pdf.